Wishbone Day: Have you shared your Wishbone Day photos? 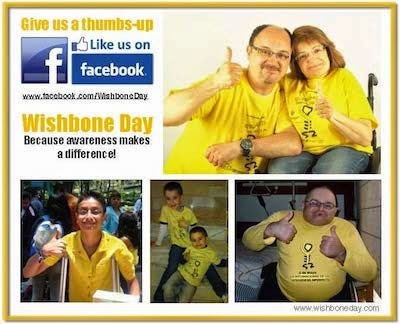 This year we've make it SUPER easy for you to share your Wishbone Day photos. Check out these 3 easy options. Follow Wishbone Day on Facebook so you can tag Wishbone Day in the photos you want to share with us. The photos you tag in the Wishbone Day facebook album will be eligible for selection in the WBD2012 video! NOTE: People will be able to view a tagged Wishbone Day photo on our Page if they are already able to see it based on its privacy setting. Tagging Wishbone Day in a photo doesn’t change the privacy setting for that photo so be sure to update the privacy settings to public view for your photo or album. If you can't see your photo on our page, we won't see it either. Check your privacy settings. Only those photos viewable in public settings will be used in the WBD2012 video. You can upload your photos to your own hosting site ie. Photobucket, Picsaweb, Flikr or DropBox and give Wishbone Day viewing and download permissions to your Wishbone Day folder. Permissions can be sent to photos@wishboneday.com. By giving Wishbone Day permission to view and download your image/s you'll be granting Wishbone Day permission to select those photos for use in the Wishbone Day 2012 video.